In 1979 the Soviet Union invaded Afghanistan. This event, along with the subsequent civil war that erupted when the Russians left Afghanistan, led millions of Afghans to seek refuge in neighbouring countries. A prime spot for refugee resettlement was in and around the city of Peshawar in north-western Pakistan. 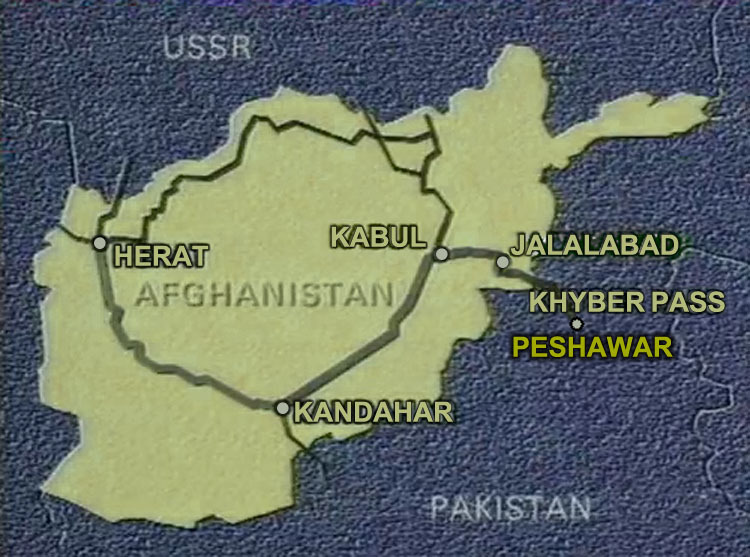 The newsreel below, filmed on the Khyber Pass, a crossing point between eastern Afghanistan and Pakistan, documents the movement of refugees over the border two months after the invasion. Many of the Afghan photographers we met, including those shown below, had at some stage of the Russian-Afghan war, or the proceeding civil war, relocated with their families to Peshawar as well as the surrounding region. Some of them eventually managed to return home, while others remain in Peshawar to this day. The map below shows some of the main spots where Afghan box camera photographers worked in the city, often the same vicinities where Afghans lived. 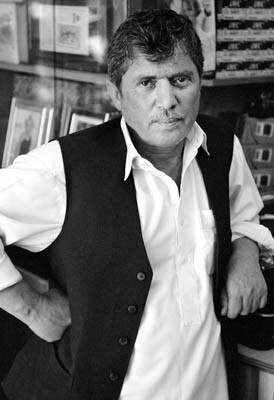 Shahi Bagh, a park neighbouring the Afghan Colony area, was a popular spot for Afghan box camera photographers in the 1980s (see Kamal's portfolio). The shot below taken in Shahi Bagh was actually 'set up' by an American who lived in Peshawar, Noor Muhammad Khan. See more of Mr. Khan's photographs here. Courtesy of Noor Khan ©. It is the Board area of Peshawar, however, close to the once sprawling Afghan refugee camp of Nasir Bagh that was the centre of kamra-e-faoree activity in the city. Below are two of the spots were kamra-e-faoree photographers used to have pitches in the area. 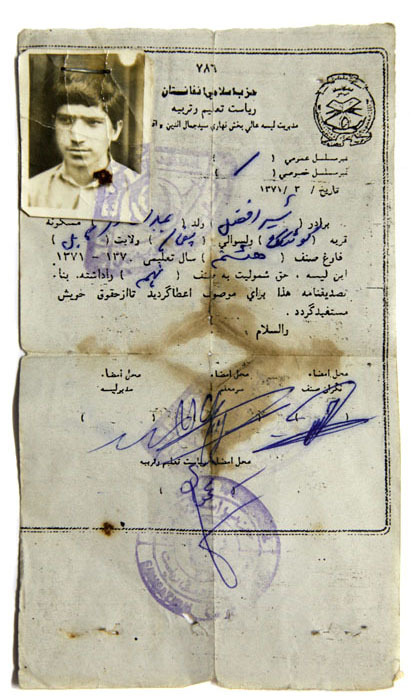 Afghans living in Peshawar after the Russian invasion often had box camera photographs made for bureaucratic purposes such as for the Pakistani government issued photo-identity card given to Afghan refugees, the Shanakti Pass. Afghan refugees also had to negotiate Afghan bureaucracy in the city. Afghan Mujahedin parties based in Peshawar who were fighting the Russians had their own system of bureaucracy with its accompanying paperwork demands. 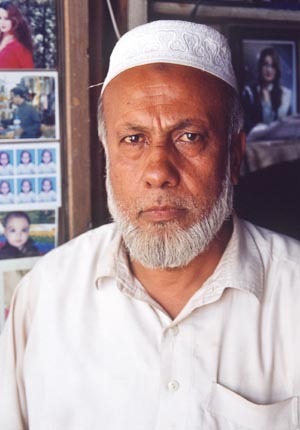 Abdul Rehman's school certificate, pictured below, baring his box camera photograph was issued by one such Peshawar-based Mujahedin party. .. Courtesy of Abdul Rehman. Committees of Afghans were appointed to take care of day-to-day matters such as issuing food rations to refugees in the camps. If an Afghan family applied for food rations they would need a group photograph of family members, which was considered as proof of the number of family members and indicated the amount of per-head rations they could be issued with. Afghan refugees seeking an economical photo for the task inevitably chose box camera photographs. 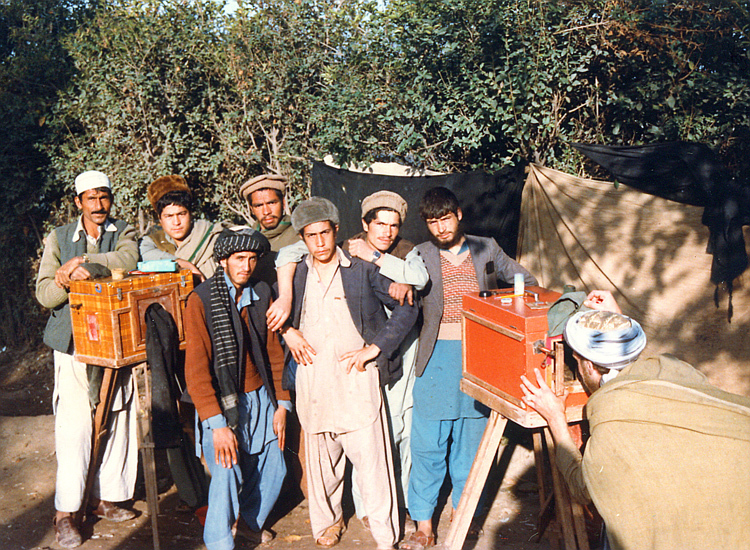 There was a huge demand for family box camera photos in particular after 2002 when the United Nations High Commission for Refuges (UNHCR) instigated a repatriation scheme for Afghan refugees from the refugee camps in Pakistan: the UNHCR required identity photographs to accompany the documentation they issued returning Afghans with. 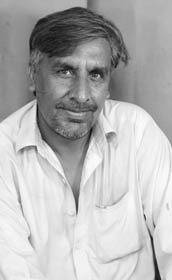 During this time Afghan box camera photographers in Peshawar experienced a boom in business (see Izzat Ullah's and Abdul Rehman's portfolios). Besides working in the main Afghan areas of Peshawar, a number of Afghan photographers also worked on Cinema Road, the popular entertainment street of the city where one can find cinemas, music stores and photo-studios. Although the area was once home to six cinemas there are at present only three. Picture House cinema on Cinema Road. Some photo studio proprietors on the street recall how in the 1960s - the time of their youth - going to the cinema was considered to be something "loafers" did, an activity that would have to be kept secret from their parents. This perception has not died out. In addition cinema-going in Pakistan is out of favour with strict Islamic groups, as well as being in competition with cheaply available DVDs, satellite television and the Internet. This is a gallery of images of Cinema Road taken in 2012. 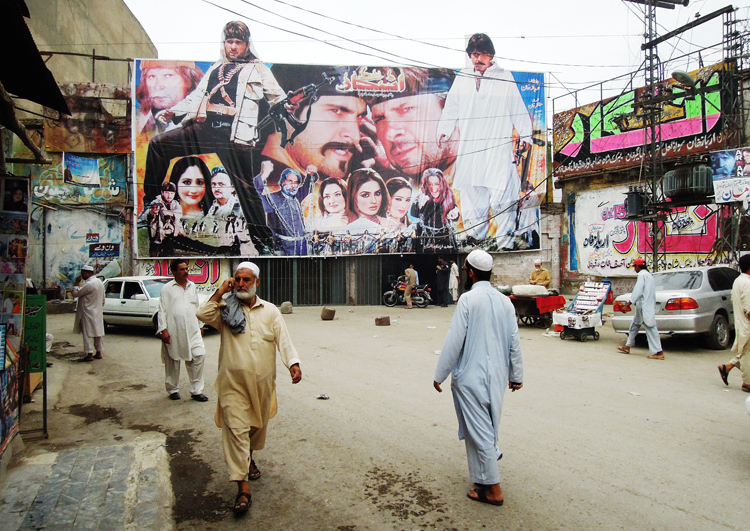 Traditionally, hand-painted billboards advertised movies on show, and a small number are still produced in Peshawar today, like this one below. As well as hand-drawn posters, a smaller scale of advertisement than the billboards. 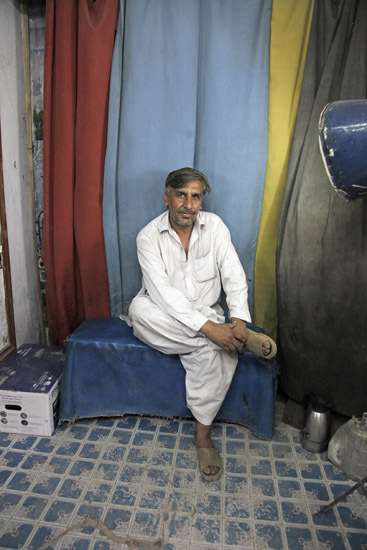 After 1979 a number of Afghan box camera photographers set up pitches on Cinema Road, renting space on the street outside photo stores from local studio owners (see Muhammad Iqbal's portfolio). 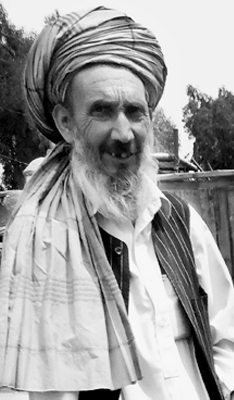 Occasionally, these Afghans passed on their skills in box camera photography to locals. 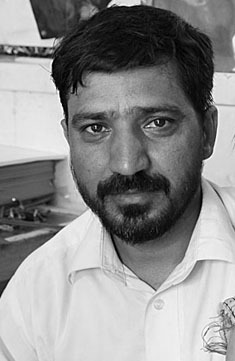 Tahir, below, worked on the box camera for eight years after being taught by an Afghan; he's also a skilled hand-colourist. The hand-coloured photo on the right (his work) is of his daughter. 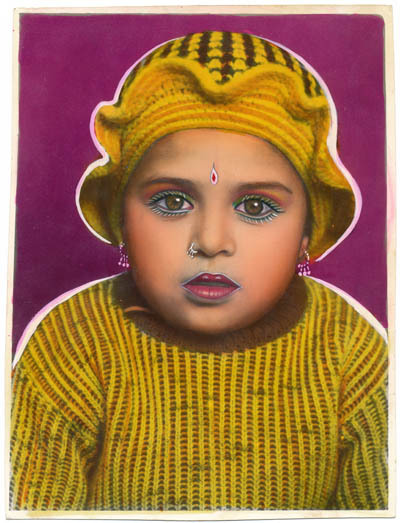 More of Tahir's splendid hand-coloured photos can be seen here. 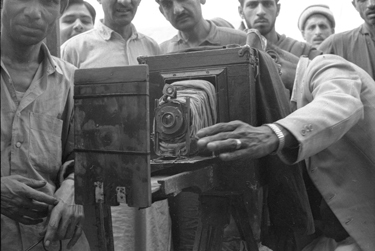 Pakistani box camera photographers used to work on Cinema Road long before the influx of Afghan refugees. Both of the gentleman below, who are now in their seventies, have worked with Pakistani-style box cameras on the street. Aslam, on the right, has an interesting theory about the evolution of the Afghan-style box camera. The paper negative box cameras they used differed from the typical Afghan box camera in that they had an external focus and the sleeve was at the back (although occasionally the focus was of fixed focal length). The camera is known locality as the 'minute' camera. This is a photograph of a minute camera taken near Peshawar in 1969. 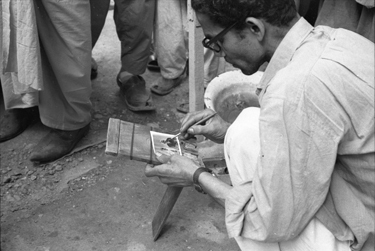 The photograph on the right shows the photographer tinting the negative to balance the contrast in the positive, a technique well known to Afghan box camera photographers. Courtesy of Charles Berger ©. 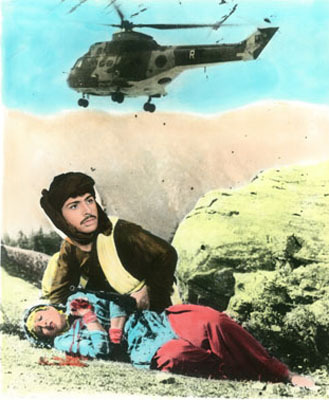 The studios on Cinema Road were (and still are) well known for their photo-montages of customers, like these ones below made in the 1980s that were inspired by local-made Pashtun language movies, and influenced by the neighbouring war in the Afghanistan (as can be deduced by the presence of the military helicopter in the background). Courtesy of Ed Grazda ©. Courtesy of Benjamin Gilmour ©. This is the movie-clip that the above montages are based on. The film is called Bangles 'n' Cuffs: bangles in reference to decorative jewelry and 'cuffs to handcuffs. Notice that there are no helicopters of any kind in the background. 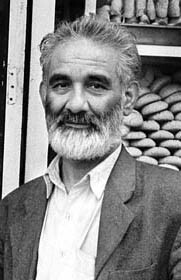 The government of the United States supported the Afghan Mujahedin in their fight against the Soviets by unofficially supplying them with arms, and thus set Afghanistan as a stage for the Americans to fight the Cold War against the Soviet Union by proxy. The war influenced popular culture in the USA. 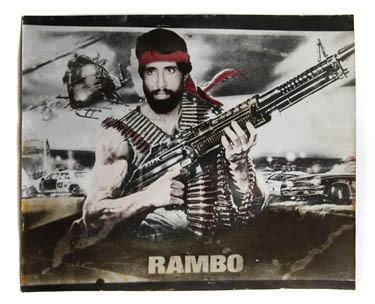 In 1988 the Hollywood film Rambo III was released wherein a US military veteran (Rambo) fights on the side of the Afghan Mujahedin against the Soviets in a bid to free a captured friend. 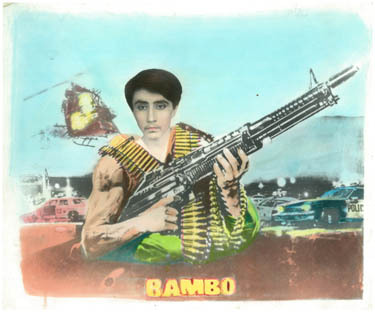 An international success, the film was popular in Peshawar, a base for real-life Mujahedin operations. The film's popularity was reflected in the poetically licensed montages of Cinema Road. .... Montage by Muhammad Iqbal. . Courtesy of Benjamin Gilmour ©. Photographers on Cinema Road also produced standard hand-coloured portraiture. 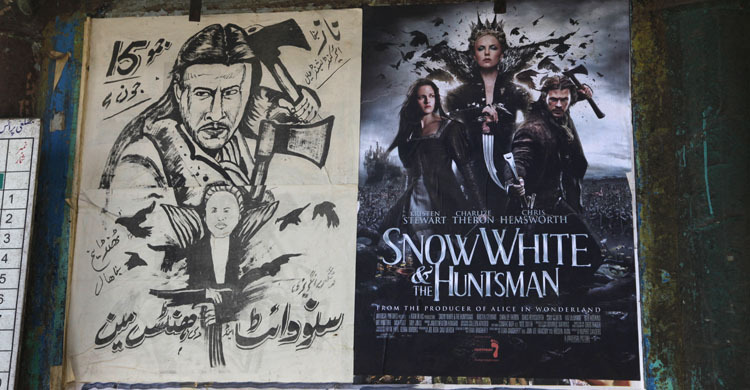 A gallery of hand-coloured portraits from Peshawar, some of them made on Cinema Road, can be seen here. 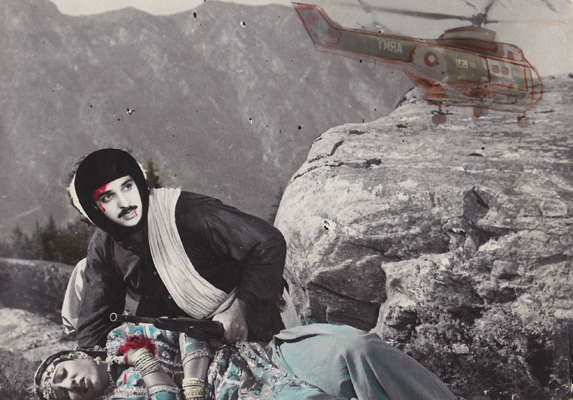 A collection of hand-coloured photos from Kohat, a town south of Peshawar is viewable here. The above montages were generally made with medium format film which the photographers in Cinema Road then multi-exposed during the enlarging process. The resulting print was hand-coloured following the customer's and/or photographer's wishes. You can see more here. 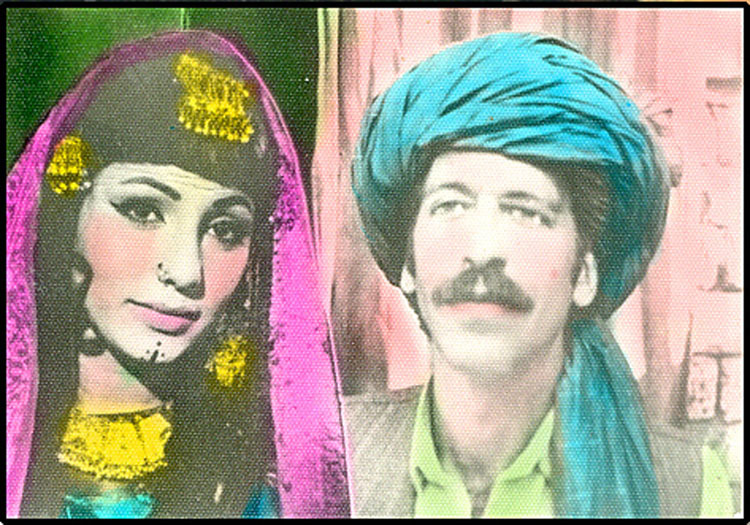 Some of the box camera photographers who worked on the street also made montages like the hand-coloured montage below showing a customer (Noor Muhammad Khan from the Shahi Bagh photo above) with the popular Pashtun actress, Yashmeen Noor. Occasionally studio photographers on the street would hand-paint the montages that the box camera photographers made. Courtesy of Noor Khan ©.q..
Peshawar has also been a supply station for Afghan photographers (of the box camera variety and otherwise) over the years. Merchants would come from as far away as Herat on the Afghan-Iranian border to stock up on photographic materials. Companies such as Kodak, Fuji and, as can be seen below, Agfa, had stores in Peshawar. 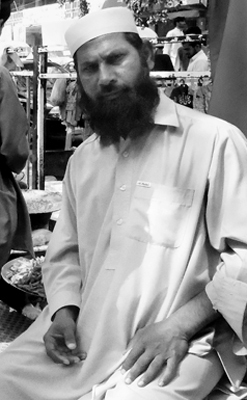 Historically, photography in Peshawar has been more developed than in Afghanistan. Peshawar was part of what could be considered a borderless photographic environment in the form of British India until 1947, where photography flourished as a highly sophisticated endeavour. Some of the first photographs taken in Afghanistan were by photographers living in British India (read more in the about photography in Afghanistan section). In pre-partition times photography in Peshawar was often found in the hands of Hindu and Sikh photographers. Partition between Pakistan and India in 1947, however, instigated a mass migration of Hindus and Sikhs to the new state of India, and in the opposite direction, Muslims moved to Pakistan. Photography in post-partition Peshawar, therefore, moved, we were told, into predominantly Muslim hands. 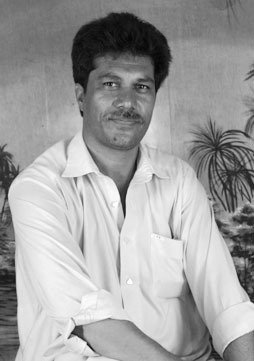 The Muslim photographers who came from India passed on their photographic skills to trainees who themselves were sometimes newly arrived migrants. The outgoing Hindu and Sikh photographers sold their studios on. It should be noted that Afghan Hindu and Sikh photographers continued to work over the border in Afghanistan. 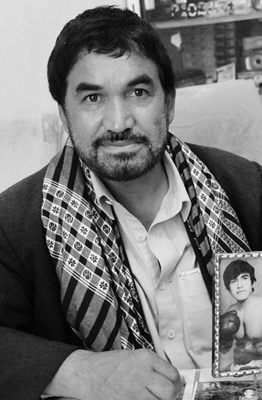 Photographers like Daoud, below, was taught by an Afghan Hindu photographer in Jalalabad. Daoud presently has a studio on Cinema Road. 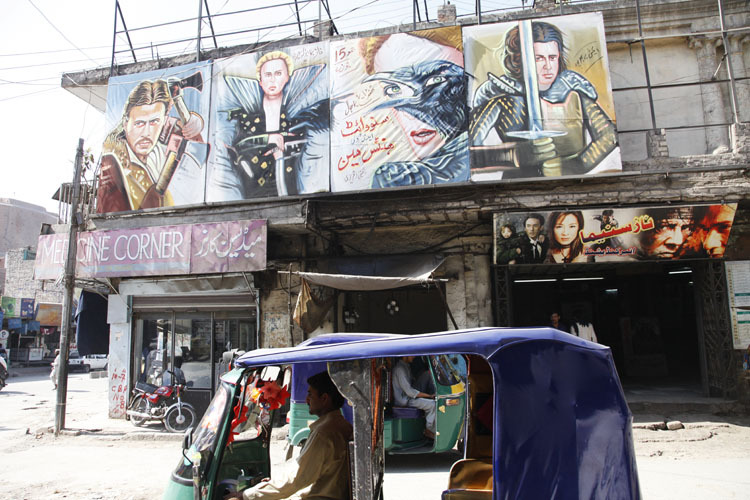 Some of the oldest photo studios in Peshawar, Azeems and Zaidis, are found around Saddar Road, a more upmarket area in comparison to Cinema Road. 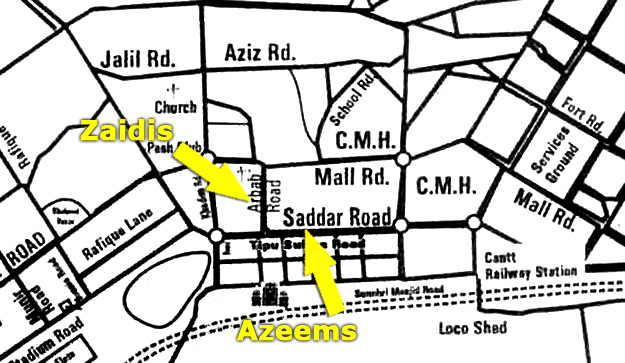 Azeems was founded in 1947 by a photographer who came from Delhi and trained the father (Azeem) of the present owner. Zaidis opened up shortly after Azeems. 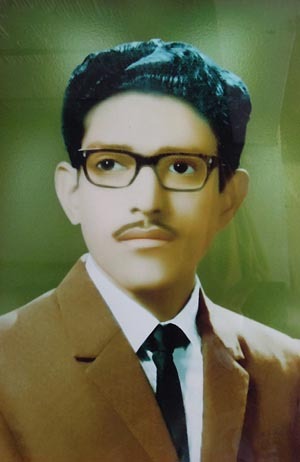 Like the original owner of Azeems, Syed Ashraf Ali Zaidi came from India. 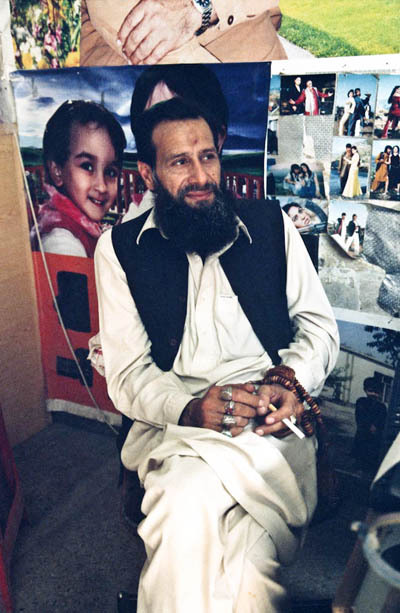 His son-in-law Abdul Rab now runs the studio. Here's a gallery of photographs from the studio including a photograph of Muhammad Ali Jinnah, the founder of Pakistan, taken by Zaidi in 1947.